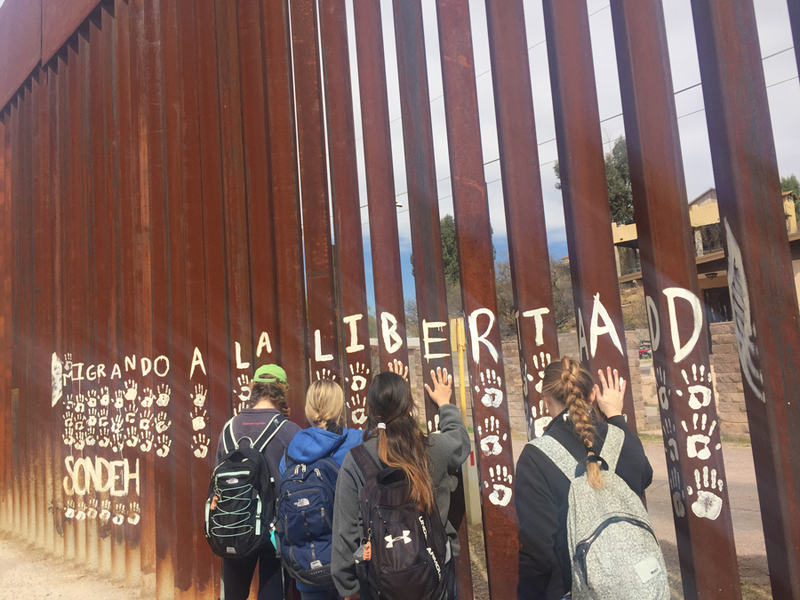 During their first full day in Arizona, the group from Notre Dame Prep had the opportunity to cross into Mexico, visiting the border area in Nogales. The students noted that there was a visible contrast between the American and the Mexican side of the wall located there. Today, began with breakfast and saying farewell to the lovely Santa Fe Ranch. Then half of us went across the border to serve breakfast to migrant workers while the other half went to leave water jugs in the desert for the migrants. It was an indescribable experience. The migrants we met had so many struggles, but were still so full of hope and joy. Their bravery was astounding; they were risking everything for their dream of a better life. They dreamed of being a few miles north yet despite the short distance, the dream seems unachievable. I felt so helpless not being able to help them achieve their dream. In our Constitution we have the right to the pursuit of happiness, yet we deny these migrants these rights. 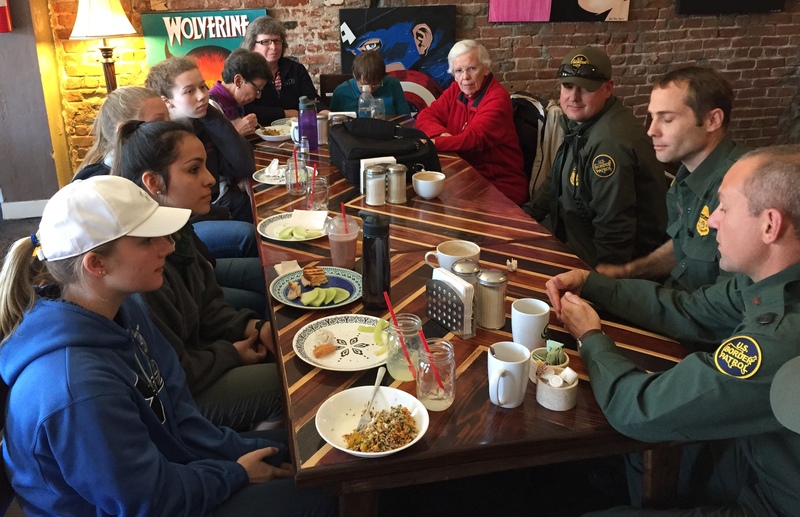 Students and staff from Notre Dame Prep in Arizona had lunch with members of the United States Border Control. It was a informative experience in understanding the experience of all those who serve on the border. We had lunch with four community officers. Initially, upon arrival the officers intimidated us all because they were still on duty. However, we quickly relaxed and felt at ease. We realized how “real” they were. All are married, and one has children. Although, they could not speak of their political views, it was understood while on duty they have a job. Their one job is to serve the United States and prevent any illegal trespassing from the Mexican border. Notre Dame Prep staff and students prepare for their upcoming visit to the U.S.-Mexico border. From left: Director of Service, Steve Pomplon; students Taylor Connell, Jo Montenegro, Lily Brow and Ally Goucher; Coordinator of Special Projects, Laurie Jones. 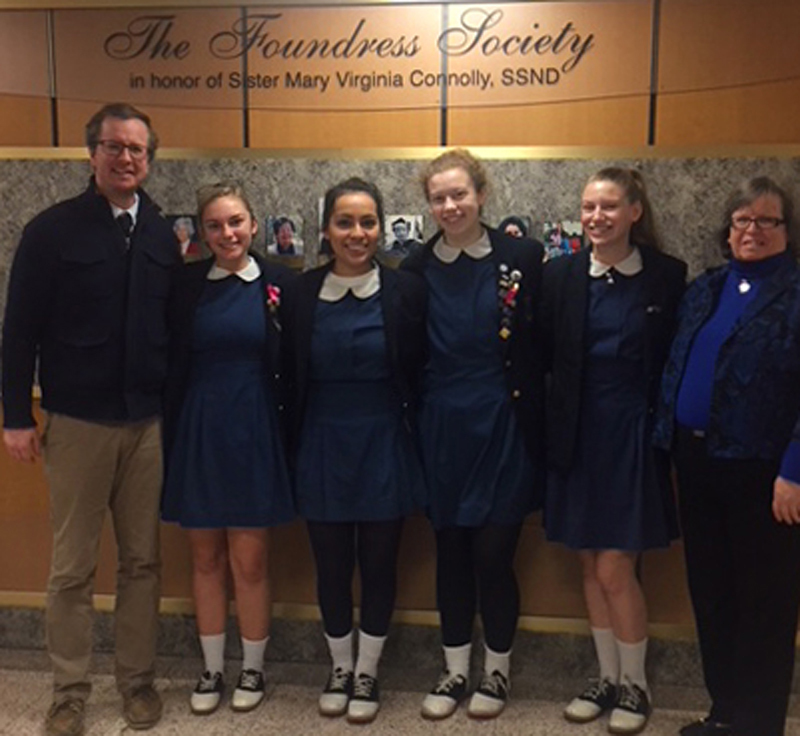 Students and staff from Notre Dame Prep in Towson, Maryland, will be spending the final week of Lent, March 25-31, participating in the SSND Mission Awareness Program (MAP), an immersion experience with the School Sisters of Notre Dame who minister on the U.S.-Mexico border. The MAP experience will provide the the students an opportunity to learn more about migrant concerns, while exploring life in a diverse border community. During their stay, the group will share in prayer, community and ministry. Steve Pomplon, Director of Service at Notre Dame Prep, and Laurie Jones, Coordinator of Special Projects, will accompany the students to Arizona.